At the beginning of the month, I submitted J. M. DeSantis: The First Ten Years to Amazon and Ka-Blam (IndyPlanet). It seems like, since the book has such a complex layout of text and images (you can see for yourself when you get a copy), it’s taking both companies some time to review the files and defer to me to make any necessary corrections before the book goes to print. This is the first time I’ve both expanded to Amazon’s platform and published a book of this size and length (8” x 10” 164 colour pages), never mind the complexity of the layout (which I spent over 100 hours working on in February alone), so please just be patient. The book is on its way, it just may be a little longer than even I expected before it’s available. 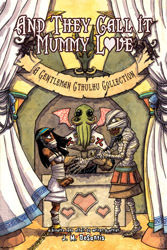 With that, because they were submitted together, And They Call it Mummy Love: A Gentleman Cthulhu Collection has also been held up. But I expect that as soon as the above collection is available, Mummy Love will follow. As for the two in-development projects, I posted the cover reveals for both of them last week on social media (seen above in the banner image). The Tainted Ones is a short horror comic, and I spent most of the remainder of last week posting progress on the very intricate first page. My hope is the book will come together fairly quickly (including the lettering stage by my letterer, Mindy Lopkin). 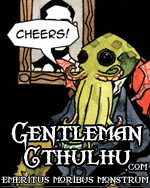 I expect the comic will be available on Comixology and IndyPlanet by the end of April. The Tainted Ones is also going to have two versions: the eight-page comic, and a larger format book (perhaps the length of a graphic novel?) which will include the entire development of the book: sketches, notes, scripts (drafts), and process. That second version will publish under the title The Tainted Ones: Praxis, and (I think) will be a great way to show my entire process of writing and drawing a comic. 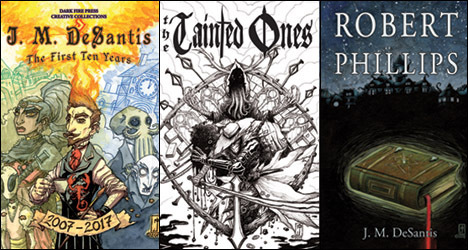 Both titles are currently listed on the Dark Fire Press website (as well as other titles): darkfirepress.com. The other project, Robert Phillips, is a Lovecraftian novella I originally wrote in 2008 and which I’m currently revising and editing for publication a little later this year (I’m aiming for May). That said, if you follow me on social media or sign up for my mailing list (quick form near the top of the sidebar), you’ll be notified as soon as the books are available. I’ll post the news here as well. Or you can just keep checking darkfirepress.com as that site will list all of the links to purchase those and future books I self-publish through DFP. Hopefully I’ll have some more news soon.